In Flack this week: #DaveJaVu, PR ethics debate rumbles on, and conquering fears for comedy fundraising. Folks working at Ready10 might privately think one David Fraser is more than enough, but Flack is aware that there are two David Frasers operating in UK comms circles – Ready10 founder David Fraser and Help for Heroes head of comms David Fraser. The pair, who are connected by mutual friend Penny Porter at Capstone Hill, recently caught up for a spot of lunch. "I’ve been aware of ‘the other one’ for a few years now and we’ve always talked on social media about getting together," Help for Heroes Fraser said. "We both agreed we’ll never work together though as the employee of the month competition could get really tricky." The Ready10 boss added: "I was always confident that I was the best person in PR called David Fraser, but now I’m less sure. It was great fun though and we might well make #DaveJaVu an annual event." Speaking of Ready10, remember that Provoke Piers website they created, which uses some form of AI to generate lines to rile up the Good Morning Britain presenter? Flack thought the concept was ace, particularly given how much extra social media attention a campaign can generate if it gets under Piers Morgan’s skin. Recently, the good sports on Good Morning Britain decided to put Provoke Piers to the test. Earlier this week, CIPR president Emma Leech penned a strongly-worded rebuke of unethical PR. The column was in response to the co-owner of Bland PR, using a middle name as a surname, pitches a Sugar Free February challenge featuring her client’s sugar-free marshmallows to MailOnline. Leech correctly pointed out the industry should have learnt a lesson from ‘Sweaty-gate’ about the dangers of unethical PR practice. It was pointed out to Flack by the ‘Agency Doctor’ that the CIPR still has the individual behind Sweatgate as a member. It seems odd that the CIPR is warning practitioners to meet the highest ethical standards when after having had their PRCA membership revoked the individual involved in ‘Sweatygate’ was then welcomed into the CIPR membership. A case of ‘do as I say not what I do’ ? The CIPR has been approached for comment. This time of year the words "Lenny" and "charity" inevitably conjure up images of Mr Henry and his Comic Relief endeavours. But Flack has heard that a Yorkshire-based PR, design and digital agency seemingly (but not actually) named after the legendary comedian is having its own good-cause drive. To celebrate 10 years in business, The Lenny Agency plans to complete 10 challenges in 10 months to raise money for the Alzheimer’s Society. The team will be facing their fears through various bespoke challenges, which include male leg waxing, a live Bushtucker Trial, a fancy dress park run, scaling the UK’s tallest outdoor climbing wall, spending a night in a ‘haunted’ house, and (in true Comic Relief retro style) taking a dip in a baked bean bath. "Ten challenges is not going to be easy but we are determined to raise as much money as possible for our chosen charity," said agency MD Emma Leonard. "Clients, friends and family are welcome to join in the activities. The more the merrier. We’d also ask that people take some time out to find out more about supporting people living with dementia by visiting the charity’s website." Who could argue with that? Here’s a link to the Just Giving page. 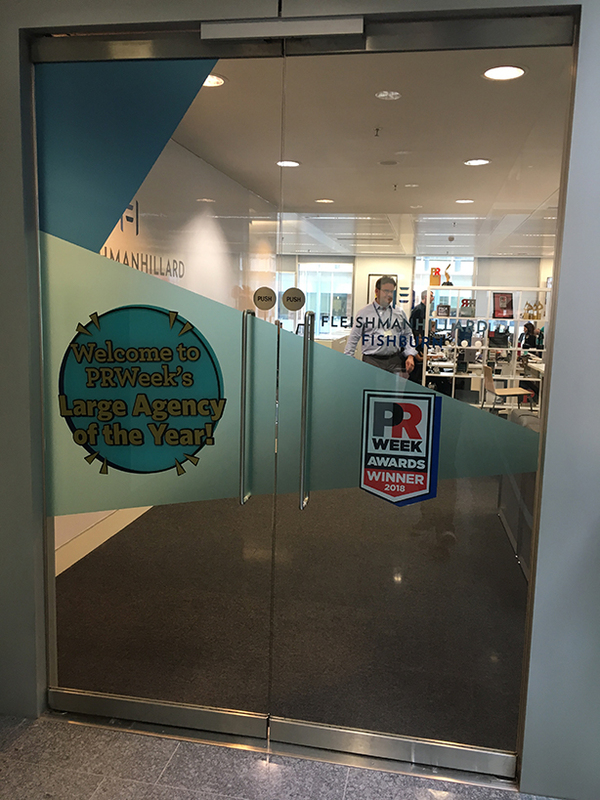 As this year's PRWeek UK Awards officially opens for entries, a visit to one of last year's winners clearly showed Flack how important the awards have become.